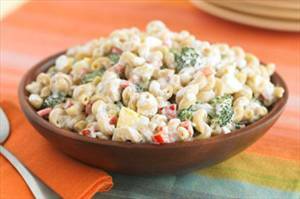 A better for you macaroni salad with lower fat and calories without sacrificing taste. A quick dinner recipe with pasta elbows and diced tomato sauce. Great pasta dish that can be eaten however you like it, hot, warm or cold. Spicy beef chili with macaroni makes the perfect meal in a bowl. Comfort food never tasted this good and without the extra calories. Garlic and spinach chicken with elbow macaroni pasta. A great healthy alternative to heavy calorie laden salads. Warm and gooey macaroni & cheese.